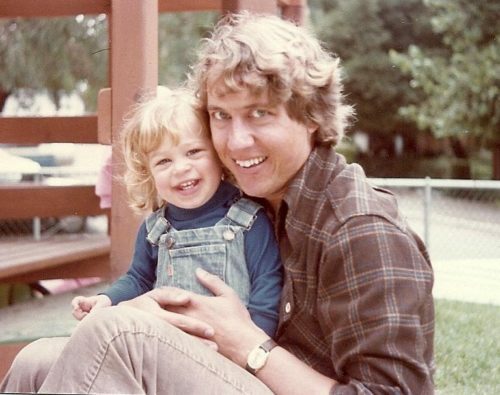 When my daughter was almost a year old and we lived in San Jose, I had the crazy idea to sew wool shirts for the men in my family: My dad, my father-in-law, my husband, and two brothers-in-law. Five wool shirts, with flat-fell seams, buttonholes, plaids to match, etc. Not sure what I was thinking, but between naps and setting up the playpen next to my sewing table, I was able to finish all five shirts in time for Christmas. The two dads got navy blue wool, my husband got a warm brown plaid, and I have forgotten what the other two were made from. This was almost 40 years ago, so some of the details have faded. When my dad passed away in 2001, I found the shirt I’d made for him still in his closet, twenty-some years later. I took it home with me and it’s been in my hall closet ever since. When my father-in-law passed away in 2007, we found his shirt tucked away in the basement. I couldn’t believe that both of these guys had kept those shirts all that time! I guess it was a hallmark of that generation to hang on to a garment forever if it was still wearable. I’m getting ready to go on a trip where I will need to layer up with warm clothing. On the recommended list is a wool shirt. Now, my dad was on the short side–probably no more than 5′ 6″–so it shouldn’t have been a huge surprise that the shirt fits me just fine. The sleeves are about half an inch too long, but otherwise, it’s a great fit. I took a close look at it tonight, and was amazed at what a good job I did on this shirt! The inside looks as nice as the outside. The leather buttons match perfectly, and the buttonholes turned out just right too. It’s a reminder of those bygone days when I had a lot of patience and determination when it came to sewing challenges. I’m grateful now that he kept the shirt and I found it when I did. I think Dad would be pleased to know that I’m taking him with me to a place he never got to see. I’ll take good care of our shirt. Beautiful story. It brought back memories of my own father. Thank you. Love this story — I did a lot of sewing in that same period and am in awe and really impressed that you made those shirts!! It was a lovely story that you found they had saved them as something special you made them! Thanks, Mary! So nice of you to stop by and comment. We were amazing, weren’t we?! How terrific to use this shirt once again!Leather buttons and button holes, I am totally impressed. I well know back then button holes were not a flick of dials but a challenge! Haralee–you’re right about the buttonholes back in the day! What a wonderful keepsake from your Dad! You are obviously an expert when it comes to sewing garments, which is probably why they lasted so long. How great that you were able to wear this shirt on your adventure to Antarctica. Thanks so much! And I loved wearing the shirt and having the feeling my dad was sharing the adventure with me.